We create informative, appealing, and interactive visualizations using a variety of tools. Visualization is a key component of data analytics. Decisions need to be made quickly yet still based on sound information. Visualization distills data down to more palpable and comprehensible information. We break our visualizations down into two categories that are useful to organizations. Tableau, Plotly, PowerBI, Bokeh, Matplotlib, GGPlot, and more. 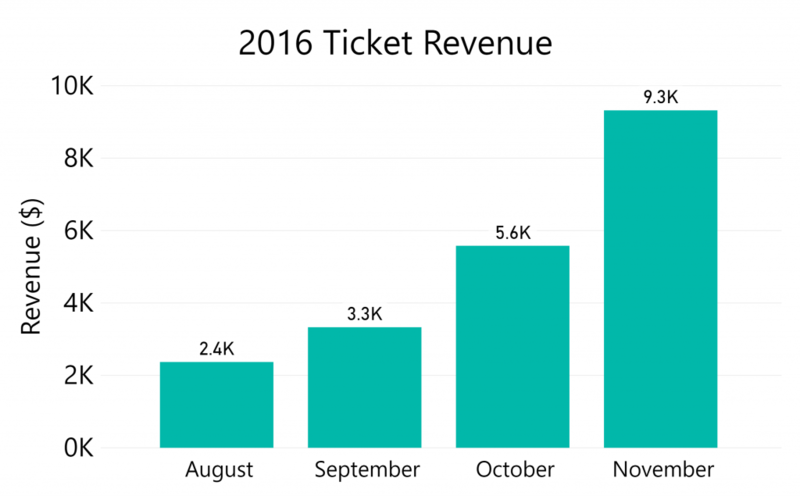 Context: The image to the left displays ticket revenue before a major music event. We work with you to pinpoint and clarify the questions and/or objectives of interest. We don’t just dive into the data without context or planning. Our abilities span across many platforms and skillsets whether your organization uses Tableau, PowerBI, Excel, Plotly, or R. We’re adaptable. Visualizations quickly become outdated if they are not integrated with a dashboard that pulls updated data frequently. We work with you to think ahead. Instructions: Hover your mouse over the graph and you will see tool options appear in the upper right hand corner. You can use your mouse to mover around the graph. Zoom in using your mouse scroller or the zoom button. 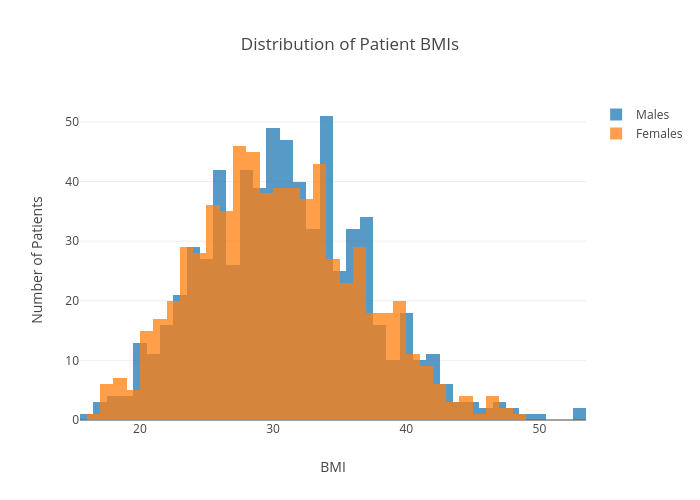 Hover over a specific point to see a specific bin of patients and their BMI within the distribution. Context: The image below the displays the distribution of patient BMIs for males and females from a particular healthcare system population. How could this benefit you? Exploratory analyses are the first step in understanding your data. Distributions are just one of many of these that help paint a picture of your dataset before moving into more complex or predicative analyses. Why rely on static charts when you can have an interactive dashboard that can be built into your intranet? Instructions: Hover your mouse over the graph and you will see tool options appear in the upper left hand corner. You can use your mouse to mover around the graph. Zoom in using your mouse scroller or the zoom button. Hold the shift key to move the map. Hover over a specific point to see a specific hospital, location, and ranking. Context: The image below displays overall hospital ranking (worst – 0 though 5 – best) registered with Medicare across the U.S.
How could this benefit you? Do you have geographic data you are looking to visualize and see trends in performance? Maybe you want to look at specific parameters from a bird’s eye view of all of your locations? These interactive visualizations can be embedded on websites if you have to display to the public or in private intranets/dashboards that can be updated frequently. Instructions: Press the Play button to activate the animation You can use your mouse to move around the map. Zoom in using your mouse scroller or the zoom button. Press the stop button and use the scroll bar at the bottom to move between years. 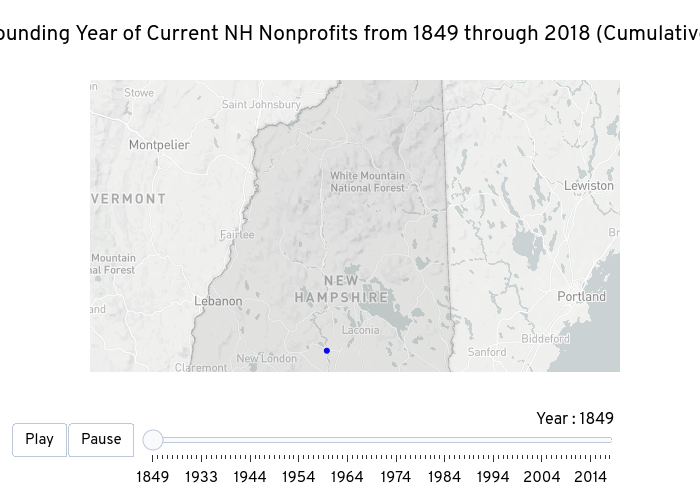 Context: The animation below displays the cumulative addition of current New Hampshire Nonprofits over time by year. Data Source: IRS Public Records. How could this benefit you? Do you have geographic data you are looking to visualize and see trends and patterns over time? Many organizations have data that spans years and decades but don’t often seen the patterns over time. Our visual animations can help see your organizations trends in an attractive and highly informative manner.